“This one’s gonna be lively,” rapper Ocean Wisdom says of this “maaaad” festival gig. It doesn’t exactly take sage-like levels of pre-meditation to believe a High Focus show on this year’s line-up will bring da ruckus – something anyone who’s been to their nights around the city will know they have form for. The label has consistently produced some of the UK’s sharpest, funniest hip-hop records since 2010, but the notion of a showcase at the Dome feels a bit like the cool kids ending up at the top table at a posh family gathering. There are many reasons to enjoy Captain Wis’s work, not least because, on ‘Splittin’ the Racket‘, you can see him standing on a car roof introducing himself as “straight outta Brighton, a crazy motherf***** named Wizzy” while a granite beat kicks in, the video having opened on the mean streets of Brighton Station. But the track that perhaps gets spoken about most from his excellent debut album, ‘Chaos ’93’, is ‘Walkin”. As well as roaming through London gradually devouring a pint in the video, there’s a 45-second stretch on the album opener when the Eminem fan raps faster (and, arguably, much more eloquently) than his hero in his prime. 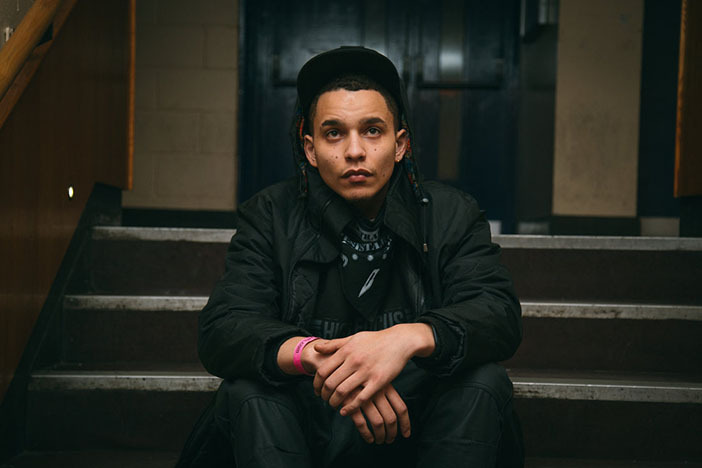 The ideas and rhymes come so thick and fast that it’s no wonder Kate Tempest, who Wis is surely a direct creative blood relative of, signed him up for the fest. Two fellow High Focus favourites join him: Jam Baxter, a self-styled “skulking young William Shatner” whose smooth flow and surrealism should be a fine foil for Wisdom, and masked MCs The Four Owls.